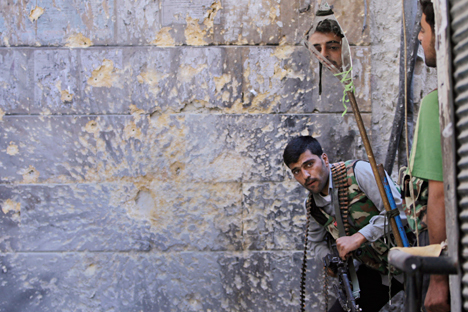 A Free Syrian Army fighter looks through a mirror which helps him see Syrian troops from the other side, as he takes his position with his comrade during fighting, at the old city of Aleppo city, Syria. RBTH presents a selection of views from leading Russian media on international events, featuring reports on Moscow’s official announcement that it is now supporting the Free Syrian Army, Nicaragua’s call on Russia to participate in the building of the Nicaraguan Canal, and a fourth-quarter hike in gas purchases from Russia by Turkey. Moscow has officially stated that the Russian military group in Syria is now supporting the opposition Free Syrian Army (FSA) in the war against ISIS, the news website Gazeta.ru reports. Russian President Vladimir Putin was the first to announce this during his speech at a meeting of the board of the Ministry of Defense. "I want to emphasize that the work of our aviation group is supporting the joint efforts of both government forces and the Free Syrian Army,” said Putin. "Now several of its units numbering over 5,000 people are engaged in offensive operations against terrorists, alongside regular forces, in the provinces of Homs, Hama, Aleppo and Raqqa,” he said. "In addition, we are supporting them from the air, as well as the Syrian army, assisting them with arms, ammunition and providing material support." This information was confirmed on Dec. 14 by the Kremlin's spokesman Dmitry Peskov. "Almost no one in the camp of the Syrian opposition has a united organized structure now, except the Islamists such as ISIS or Al-Nusra, but there is no point in cooperating with them,” said Yevgeny Satanovsky, president of the Institute of the Middle Eastindependent research center. "If in the framework of the armistice, there are some groups that call themselves part of the Free Syrian Army, who are ready to carry out the defense of their villages and towns against the Islamists, then why not work with them," he said. The project to build the Nicaraguan Canal has stalled, reports the news website Svobodnaya Pressa. Previously, the idea was planned to be implemented with the help of Chinese investments. Now, however, Nicaraguais calling on all-comers, and not least of all – Russia. “We look forward to the cooperation and participation of the international community, in particular the Russian Federation,” said Nicaraguan President Daniel Ortega on Dec. 13. The building of the waterway has been postponed for a year. The daily La Estrella de Panama attributed the main reason for the freezing of construction to a report by environmentalists raising concerns about the canal’s impact on the environment. But at the same time, the newspaper said the real factor in the postponement of the project was the financial problems of the main contractor – the Hong Kong Nicaragua Canal Development Investment Company (HKND Group). "I suppose that China has refused to participate in the construction of the canal for now because of the lack of finances," said Mikhail Belyat, an expert on Latin Americaand a researcher at the Russian State Humanitarian University. Mikhail Alexandrov, a senior expert of the Center for Military and Political Studies at the Moscow State Institute of International Relations,cautioned against Russian participation in the construction of the Nicaraguan Canal. "I think that in the current situation, it is not worth Russia getting involved in this rather risky plan," said Alexandrov. "Moreover, the whole project caused some doubts from the start. For example, it is unclear whether there was any Chinese state involvement in it. I think if China was interested in building the canal at a state level, the Chinese would not leave so easily," he said. Russian gas exports to Turkey could increase at an annual rate of about 1 billion cubic meters in the fourth quarter of 2015, almost offsetting the decline in purchases in the past few quarters, reports the business daily RBK. According to Ukraine’s state gas transport monopoly Ukrtransgaz, since Dec. 9, 2015, the pumping of gas through the Orlovka station (this corridor is used to supply gas to western Turkey, as well as Bulgaria, Romania, Greece and Macedonia) has reached record levels – more than 68 million cubic meters per day. If the pumping persists at the same level until the end of the year, in the fourth quarter of 2015, Russia’s state-owned gas giant Gazprom may supply 7.5 billion cubic meters of gas to Turkey compared to 6.59 billion cubic meters in the fourth quarter of 2014, according to the calculations of the Agency for Gas Information. In the first quarter of 2015, Russian gas exports to Turkey fell by 1 percent, in the second by 15 percent, and in the third by 6 percent. If the volume of deliveries in the fourth quarter see an increase, Russian gas exports to Turkey couldreach 27 billion cubic meters compared to 27.334 billion cubic meters in 2014. Read more: Why is Russia opposed to Montenegro joining NATO?